I want to thank my husband, Adam, for opening me up to the love of travel. I had done a bit of traveling prior to being with him, but it wasn’t until the summer of 2011 that I absolutely fell in love with it. That summer, we took an 8-week road trip across the United States and parts of western Canada. It was in a word – amazing! Going into the trip, Adam (who had done this sort of thing before) was a bit worried that I might not handle living out of the car, being without the comforts of home, etc. so gracefully at times. However, he ended up being pleasantly surprised by my calmness, flexibility, and openness as we navigated the unanticipated ups and downs of the experience. To be honest, I was more than surprised myself. It was as if the moment we pulled out of the driveway, another “me” took over. Typically, I am extremely organized and rely heavily on lists, schedules, plans, budgets, etc. to navigate through life. I often have an underlying (or at times, overt) tenseness about the way things are going. But, on the road trip, I was more relaxed than I ever felt in my life. We had no schedule, no specific plans, and only a general idea of where we were going to go. To the “normal” me, this would be a recipe for disaster, but for some reason, I completely embraced it… so much, that my laid back attitude almost concerned Adam at times. “Are you ok?” he would ask me… “Really?” I felt like another person, or perhaps in some ways, like the person I wish I could be. Since that trip, I have channeled that energy into all of my travel experiences. It is getting easier now to just “flip the switch” to “travel mode.” Both last year and this year, Chile has been the perfect place to practice this comfort and flexibility. I would say that here “plans” are “possibilities” and that in any given situation, it is most likely that things will not work out as planned. I would also say that for some strange reason, I really like it. When I explained to the students prior to our trip that this is the way things are in Chile, I think they couldn’t really understand. But, also, those that knew me fairly well couldn’t understand how I could handle (let alone enjoy) this type of environment. Since we have been here, the students have come to understand this cultural difference and some of them, like me, have embraced it. Within just a few days of being here, many of them learned to shrug their shoulders when plans changed and just “go with the flow.” I know this has been harder for some than others, but they have all tried their best to adjust. For example, this week the students were supposed to be in placements in Santiago schools to work with Chilean children. This is a major component of our program. However, many of the local schools are currently on strike. So, there was some major reshuffling and rescheduling of students… all at the last minute. But, not one student seemed upset or frustrated with this. I know they were disappointed to not get as much time in the schools as they had hoped, but they also realize this was a situation beyond our control and thus not something worth getting worked up about. 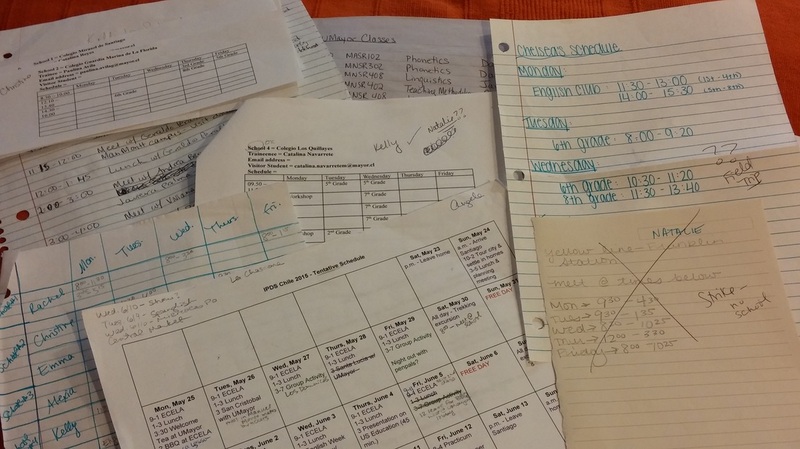 Below is an example of some paperwork with schedules, plans, lists, etc. You will notice there are a lot of cross-outs and question marks. But, in the end, everything worked out! I am really proud of how the students have dealt with every element of our travel experience. They have all, in their own ways, developed their “travel mode.” I am sure this will serve them well in future travel experiences. But, I also wonder how they, and I, can possibly bring some of this back to our own day-to-day lives. Perhaps “travel mode” does not only have to be for travel. I know this is something I will be thinking about a lot upon returning home. Speaking of returning home, it our last night here. Estamos muy triste! We do not want it to end! But, we will all be happy to see family and friends upon returning. So, it’s time for our farewell dinner now. Chao! 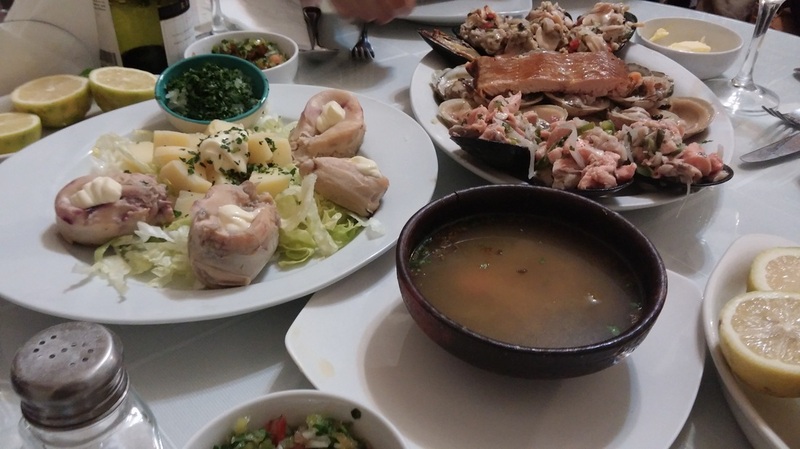 We went to a small, quaint restaurant that specializes in authentic Chilean seafood. As a table, we ordered a variety of seafood (some cooked and some raw) and shared it all. We had oysters, clams, smoked salmon, ceviche, razorback clams baked with cheese, and other types of seafood for which I don’t know the name. The picture below shows just some of what we had. The server had to bring it out in stages because there was too much to fit on the table at once! The seafood pictured to the left is called locos, or Chilean abalone. It is a form of sea snail that is native to the coasts of Chile and Peru. Que rico!! Today, Javiera, Sebastian, and I have been mostly being lazy around their apartment because we are all a bit sick. We are not sure if we really have colds, or if our respiratory systems are just being affected by the pollution, which has been quite bad the past week. It was still a nice, relaxing day with friends. I am going to go make some homemade brownies now to share for dessert. Anyone who knows me knows I love to bake, so it is nice to use Javiera and Sebastian’s kitchen to feel a little more at home. Plus, they both love sweets (especially Sebastian), so it is a nice way for me to share with them to thank them for their hospitality. Last week, I made an apple and pear crisp and they really enjoyed it. Voy a hornear! Chao! Hoy es la ultima dia de clases en ECELA. Estoy triste. I have been learning so much Spanish and I do not want to stop going to class! I have always loved being a student, but there is something particularly intriguing to me about learning another language. I hope to continue to apply my skills next week while we are still in Santiago, as well as when I am back home. Currently, I am at Starbucks doing a bit of work. I was able to successfully order a coffee, get a raspberry muffin (warmed up even), obtain the internet password, ask for a fork, and tell the man who kept wanting to clear away the last couple bites of my muffin and my coffee cup that I was not done yet… all in Spanish! 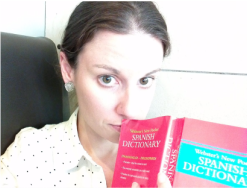 I am sure it was plainly obvious to everyone that I don’t really speak Spanish (at least not well), but it also doesn’t help that I am sitting here with my nose stuck in the Spanish-English dictionary often as I study. But, for the most part, people are patient and kind. I am very thankful for the opportunity I have had to study and learn Spanish. I have made quite a bit of progress and look forwarding to continuing my studies. I also look forward to a reflection session I will have with the students next week. It will be nice to have in in-depth conversation in order to process our experiences with language learning. I am interested in hearing about their feelings – both positive and negative, as well as ideas they have about effective and ineffective teaching strategies when working with language learners. It should be a very productive conversation. Last week, we visited San Cristobal. Once on top of the hill (either by trekking or riding a cable car), there are magnificent views of the city of Santiago, as well as the Andes Mountains. I remember arriving at the top of the hill last year and just staring out in awe at the sprawling city, blanketed in the majestic mountains. So, this year, when we arrived at the top of the hill, I was surprised and disappointed to see a fuzzy view of the city, and no mountains at all. Unfortunately, currently, the smog in the city is so bad that we literally couldn’t see the mountains at all. 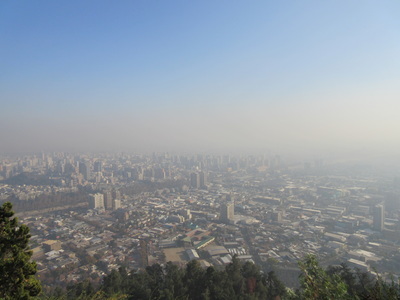 The students were still very impressed by the view of the city, but I wished they could see the mountains. Below are pictures from both last year and this year to demonstrate the difference. It is not that the pollution is that much worse this year; rather, it has not rained in a long time this year, so the pollution is more present at the moment. ﻿﻿As we discussed it, I took the students over to a vendor to show them postcards that showed the view they would be seeing if the pollution was not so bad. They were shocked at the difference. One of them commented that the pollution in Chile was so bad, and we weren’t used to it, because we don’t have that much pollution in the U.S. I was surprised that this was the impression she had, so we talked a little bit about environmental issues in our country, as well as globally. Yes, this event showed that the pollution in Santiago is a major problem, however, more importantly, I hope this situation serves as a reminder and catalyst for conversation about the overall health of our planet. For our trip this year, we all knew we were going to rely a lot on Alexia to be our “Translator” since she is the only one who speaks fluent Spanish. We are all working to build on our Spanish skills, but it is certainly nice to have someone there to communicate on our behalf when needed. Since we knew Alexia would be helping us out a lot, I thought it might be a good idea to give each student a role within the group. So, with the help of Dr. del Prado and my husband, we developed eight different roles. The students had the opportunity to nominate themselves or others for the roles and then I made the final decision based on their preferences and skills. The students were very excited to learn what each of their roles would be and have been doing great in taking on their responsibilities. Some of the students have been mentioning their roles within their blog entries, but I will share the entire list. Alexia – Translator – Alexia’s role within the group is obvious and it is one of the most important roles, for sure. Alexia is great about us pestering her with all of our questions and needs. She also shares Spanish words and phrases that could be helpful in certain situations. Then, we all get to try them out. Gracias por todo, Alexia! Kelly – Navigator – It is Kelly’s job to study and know the city and metro maps. She helps us find our way around. She made a map for us all prior to leaving that plotted each of our homestay locations, as well as other important places we visit often. This has proven very helpful! She was the first one to jump up and go find another student who was slightly lost. She successfully coached her through finding us over the phone. Yah Kelly! Rachel – Planner – Rachel’s job is to always know the schedule. She reminds everyone what is happening in the days ahead – where to be, when to be there, and what to wear. She is also in charge of heading up our communication system including our group What’s App chat and our Chilean phone system. This way, everyone is sure to get important updates. Nice job, Rachel! Christine – Social Butterfly – If you have ever met Christine (for even 10 seconds), you know she was as an obvious choice for this role. 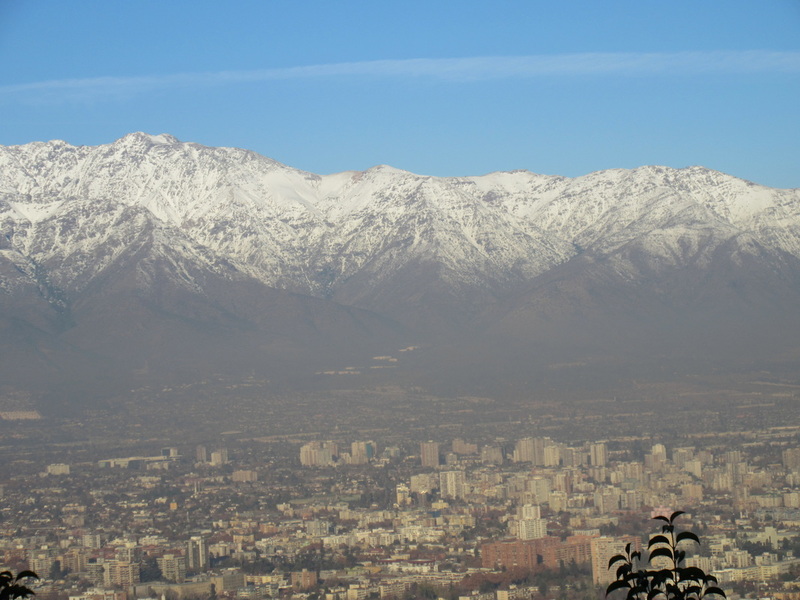 Christine’s job is to use her outgoing nature and bubbly personality to connect us to others while in Chile. She is the first one to approach others with a smile and engage in a conversation. She also leads the organization of social events with friends from ECELA and friends from UMayor. I have no doubt Christine will be at the forefront of many good times in Chile. Natalie – Blog Master – Natalie’s job is to make sure that we all post on our blogs in order to document the trip and reflect on our experiences. She also troubleshoots any problems with the blog site. She took it upon herself to create a schedule of the trip and which days we are each required to blog, though we are welcome to blog more often. She definitely keeps us honest with it. Thank you Natalie for doing such a great job of helping us with this important component of our trip! Emma – Paparazzi – Emma is in charge of making sure we take pictures and/or videos all along the way throughout our journey. She shares her photos with others for the blog and will work on putting together an overall collection of our memories as the trip goes on. If you see a group picture at our first day at ECELA, this was one Emma thought to do which was great. Unfortunately, as it worked out, Emma has limited internet in her homestay, which has proven difficult for her role. But, she still does her best. Thanks Emma! Crystal – Ambassador – Crystal’s job as our ambassador is to ensure we represent ourselves, our college, and our country in the best possible manner. She has researched and shared with the group some specific customs and cultural norms of Chile. She also reminds us to be aware of ourselves and our surroundings. And, she goes out of her way to be kind and courteous to everyone we encounter. If you know Crystal, you know she is an excellent choice for this position! Chelsea – Mama – Chelsea, who has a very sweet and caring nature, is the perfect person to be the mother figure of the group. Her job is to look out for everyone’s wellbeing – physical and emotional. She checks in on everyone and provides support or hugs when needed. She even reminded me the other day that I needed to eat, even if I didn’t feel like it. Thanks, Mama! Each day, we have a brief group meeting (usually over lunch) in which each group member shares a report on her position. This has been a positive addition to our experience and we have definitely continued to build on our community while here in Chile. Today was our first day of Spanish classes at our Spanish school, ECELA, and it went very well. It was tough for us all to be up and at the school by 8:00 a.m. after having travelled for so many hours and barely sleeping on the plane. Plus, at 8:00, the first order of business was taking a placement test! But, everyone was very positive and excited to be at school. We were each placed at our individual levels, some of us in the same class as others, but also in class with students who are studying at ECELA from all over the world. For example, I had some classes with Rachel, Christine, and Kelly, but also with students from England, Brazil, Australia, and Canada. That is one of the great things about studying at ECELA. We meet people from all over the world and we all try to communicate in Spanish since we are all in Chile studying the language. It is a unique and rewarding experience. After class, we had lunch at a café that was a favorite of our group last year (Café Colombia – shout out to last year’s group!). Then, we had a welcome tea with our friends at Universidad Mayor which was so nice! Next, we went back to ECELA for a lesson in Cueca – un baile tradicional de Chile. Finally, we had a Chilean asado with many other students of ECELA. We enjoyed the food and practiced our Spanish skills for hours! It was a long day. It is now midnight and I still have to do my Spanish homework. Estoy exhausta! I just want to close by saying I am so proud of all the girls. They are all settling in and adjusting so well, and so quickly! I am impressed! Tomorrow is the big day! I am so excited to be returning to Chile – to see familiar sites and more importantly, familiar faces. I met so many wonderful people when in Chile last year and when Chilean visitors came to visit Buffalo the past two years. I look forward to reuniting with colleagues, partners, and friends. 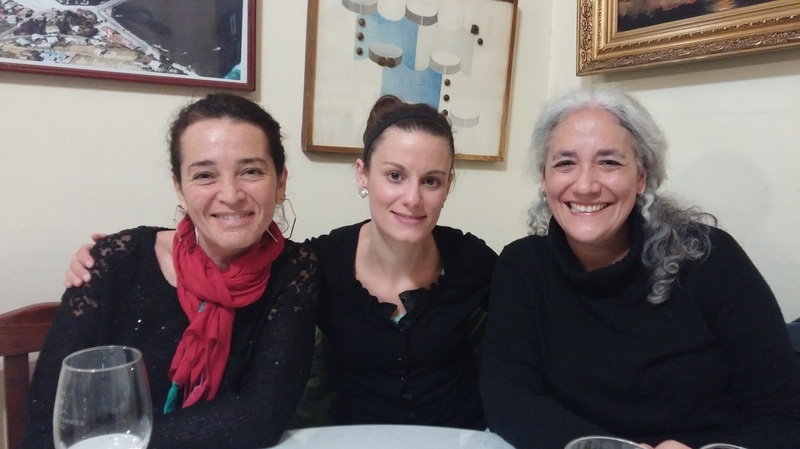 This year, I will be staying with a wonderful friend, Javiera, who is a professor of English Pedagogy at Universidad Mayor. Last year, I stayed with a host family, like the students. That was a wonderful opportunity, but I couldn’t pass up the invitation to stay with Javiera. I am sure she will make me feel so welcome and we will have many wonderful times together while I am in Chile. Below is a picture of an event put on in February by a campus group that I co-advise, the Student Council for Exceptional Children. We were thrilled to have our guests from Chile join our event. Javiera is in the back row, third from the left. I am in the front row, second from the left. Many of the people pictured are from Chile, though you likely are not able to tell which ones. These are just a few of the faces I am looking forward to seeing soon! Javiera speaks English perfectly, which is a bonus to staying with her, but I will have to ask her to force me to use my Spanish from time to time. Aside from that, we will be in an immersive Spanish class for four hours a day and also using Spanish all over the city. So, I am sure I will get plenty of practice. Nevertheless, I am proud of the progress I have made with the language thus far. I can’t wait to get back to Santiago and have the dedicated time to study the language. I have even been gently nudging my husband to start learning Spanish. I tell him it will be fun to practice together and also that he better learn because eventually, I may just drag him off to live in Chile with me for a time. I really love it that much there! But, for now, I will take my next three week visit and embrace every moment of it. Even more so than my own experience, I am really anticipating the excitement and opportunity that awaits the students. I know what a rewarding experience it was for us all last year and I expect nothing less this time around. As we prepared for our travel this semester, I had the opportunity to get to know all of the students, which was really nice. A couple of them had also been previous students of mine from semesters past, so it was great to have that foundation as well. These eight young ladies are a wonderful group and I know they will represent Buffalo State very well. I hope you take the time to check out all of their blogs to learn about their experiences and hear each of their unique reflections! Vamos a Chile en menos de 24 horas! It is now officially time to pack! Chao! So, are you ready for Chile? For the past few months, it seems at least once a day someone asks me, “So, are you ready for Chile?” I typically just give them a glazed over look and shake my head in a confused manner. Chile? What? Huh? No lo entiendo. I’m late for a meeting. I’ve got papers to grade. I’ve got a to do list a mile long. And, the Chile trip is soooo far away. Right?!? Well, as I am writing this post (after a couple friendly prompts from our conscientious Blog Master, Natalie), I realize we are leaving in less than 10 days! So, I suppose it is time to start getting ready! Upon reflection, I realize our group is actually quite prepared. We may all be haphazardly throwing items into a suitcase the night before we leave (I know I will), but we have spent this entire spring semester meeting each week – all 8 students who will be travelling, me, and Dr. del Prado (who will not be travelling with us, but will join us in spirit). 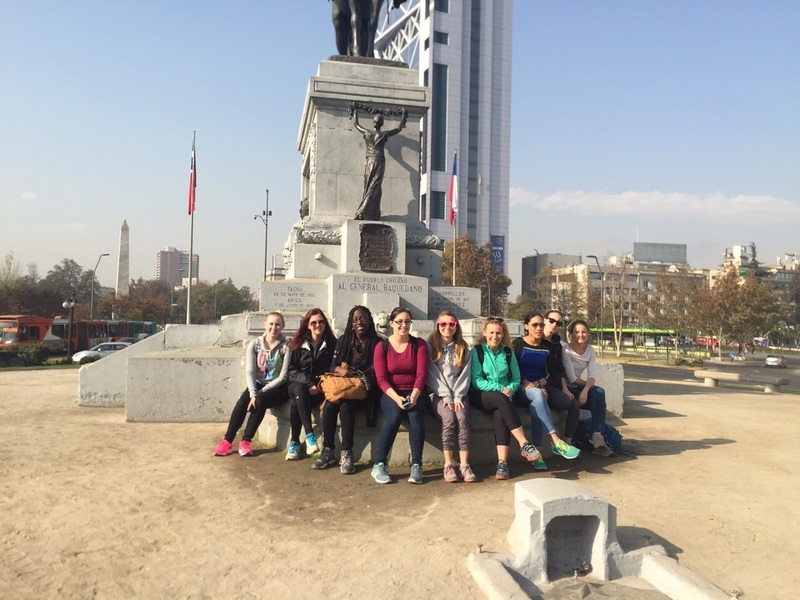 We have learned about Chile, developed research projects to complete while there, studied language learning, developed instructional activities to use in our service learning, engaged in a few basic Spanish lessons from Dr. del Prado, and handled program logistics (itineraries, flights, packing lists, safety precautions, paperwork, etc.). It has been a busy semester! We even had Chilean visitors from our Santiago partner, Universidad Mayor, join us in class for a couple weeks in February. We have all had the opportunity to connect – in person and through e-mail – with faculty and students at UMayor. I know we are all so excited to get a chance to spend more time with our friends in Chile. It will be nice to have warm, welcoming faces awaiting our arrival. At our last day in class this Monday, I handed out folders with helpful information such as a tentative activity schedule, packing list, and maps of Santiago with key locations marked. We discussed last minute questions and concerns. We made plans for meeting up at the airport. Everything is in order (or as much order as it can be given the many unknowns of this type of travel and learning experience). Checka, checka, checka. Estamos listas! My name is Angela and I am an Assistant Professor in the Exceptional Education Department at SUNY Buffalo State. I am very excited to be returning to Santiago, Chile this May/June alongside eight outstanding Buffalo State students. Please follow our blogs, and our journey!